As part of the Connected Academics initiative, partner institutions meet annually with MLA to engage with outside experts and thought leaders, assess needs, test models, and develop concrete plans to effect tangible, systemic change in doctoral education. The 2016 Summer Institute, hosted by UCHRI, took place on September 14-16, 2016 at the University of California, Irvine. The two-day institute included sessions developed and led by the three partners and a day dedicated to the collaborative development of a faculty/staff toolkit for supporting doctoral students. People always say first impressions are the best impressions. I beg to differ! My first reaction to the Connected Academics Summer Institute is one that I continue to process, and does not account for the overall success of the summit. As the title of the institute indicates, the goal of this summer program was to foster a working relationship between multiple positions in the university—faculty, students, and staff—through a collaboration of our unique vantage points. Each sector promised to come together to leverage their collective insights, resources, and networks to build a toolkit for graduate student professional development. When I walked into the conference room on the first day, I had a flashback to high school. I was understandably nervous—I had returned to an empty campus, earlier than usual, to help launch the institute as the newest graduate student researcher for UCHRI’s Humanist@Work initiative. I was excited by the fact that the conference was my first opportunity to familiarize myself with UCHRI’s mission, programming, and community. However, I was at best vaguely acquainted with Connected Academics’ goals; at worst, I was a complete stranger in a room of seemingly familiar colleagues. As I attempted to find a seat at one of the many working tables, I was reminded of the latter. While the mission of collaboration brought each participant to the table, the spatial configuration was symbolic of a different spirit. I had reminded all participants during registration to mingle and sit with strangers—after all, the point of the institute was to leverage previous working relationships while also establishing new networks. However, scanning the room for familiar faces, I witnessed a self-segregating pattern amongst participants: Georgetown faculty and students sat with Georgetown faculty and students, the University of California system occupied two tables for themselves, and so on. These spatial divisions within the room manifested in striking ways, calling into question the very possibility of humanistic collaboration. “Is this model possible in a public school with less financial resources?” asked one career advisor. “How do we account for unpaid TA labor?” was a recurrent concern among graduate students. “How can professional development be better incorporated into current curriculum?” queried faculty. Humanist work—particularly when it seeks to combine so many sectors of the university—is challenging. It is often bureaucratic. It can be political. In the end, it is almost always personal. The questions and spatial divisions reflected this. By the close of the first day of the conference, my anxieties begged the question: what does it truly mean to be “connected”? To explore the multiple professions, personalities, and experiences each person brings to the table? Where the first day’s activities could be characterized by the room’s spatial configuration—divided—day two manifested the spirit of the conference: connection. Day one was ultimately reserved for project presentations from various institutions, perhaps contributing to the segregated, spatial configuration and lines of inquiry. Day two, however, was devised for collaboration around creating a faculty toolkit for graduate student professionalization. The atmosphere palpably changed as the conference shifted programming, settling down to the “work” of Connected Academics. Together, we crafted the building blocks of what will become a robust toolkit for graduate students and the faculty/staff that support them. Conference participants broke up into working groups to shape varying components of the toolkit, including building a template to evaluate graduate student progress, designing curricular enhancements that incorporate professional development, and conceptualizing a digital collaboration platform for faculty, students, and staff to chart progress and share resources. My own working group, like most others, was a surprisingly diverse troupe. Altogether, we represented a collection of graduate students, faculty, administration, and members of higher-education organizations like the Modern Language Association and the American Historical Association. Charged with gauging graduate student progress, we settled on crafting a template for evaluating yearly and end-of-degree progress. After many characteristically humanistic conversations about the semantics of phrases like “evaluation” and “progress,” my group began to ask not what this document meant, but how does it work? What kind of information are faculty interested in reviewing, and how will they use it to evaluate the strength of their program? How can the review process help graduate students to not only self-reflexively chart their progress, but also set goals and priorities? These and many other questions brought various constituents to the table, collaborating to produce a working document that serves all sectors of the university. Like other groups, the evaluation working group was able to craft a provisional template and working language. A finalized toolkit was not produced by the conclusion of the conference. However, contrary to my first—and perhaps longer lasting—impression the mission of connecting academics was ultimately accomplished. Not only speaking through the mouth of their institutions or position within the university, individuals, through their collaboration, grew to include multiple voices and priorities. Connected, our work was made stronger. Shane Breitenstein is a PhD candidate in the Visual Studies Program at UCI. Before returning to school, Shane worked in program assistance and public policy for Pennsylvania’s largest early childhood education advocacy and professional development non-profit. 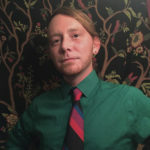 His research combines queer theory, feminist theory and cultural studies with a focus on the visual culture of childhood, media policy, and consumer activism. His dissertation questions the common understanding of the 1980s as an ideologically regressive, and sexually repressive, decade through a cultural history of media regulation and the figure of the imperiled child. He joins the UCHRI staff this year as a graduate student research assistant.